It's Hard To Imagine How Armed Teachers Might Change Schools President Trump has suggested 20 percent of teachers should be armed, to protect students. NPR's Scott Simon wonders how that might change the nature of school and how teachers and students relate. President Trump leaves the stage after addressing the Conservative Political Action Conference. He has repeatedly called for arming teachers after the school shooting in Florida. Some people at the meeting seemed to approve of the president's idea; many did not. 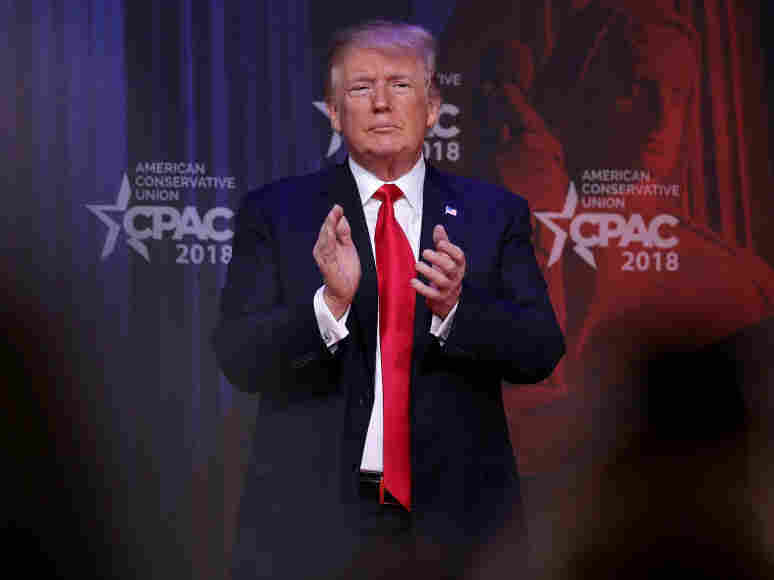 The president repeated his message to acclaim before the Conservative Political Action Conference on Friday. In the world beyond the Oval Office, David Hemenway at the Harvard School of Public Health, an expert on gun violence, calls the president's idea, "a crazy proposal," according to NBC News. And many teachers took to social media to say they're infuriated by the idea. But 42 percent of Americans told a Washington Post-ABC News poll that they believe gun-bearing teachers could have deterred last week's school shootings in Parkland, Fla. I've tried to imagine how pistol-packing teachers might change the nature of a school, and the relationship between students and teachers. Will students now advise one another, "Don't get caught text messaging in physics class! That teacher is locked and loaded!" Will principals who hire new teachers now say, "Well, his college recommendations aren't strong. But he's won marksmanship medals." And will teachers now tap a bulge under their coats and admonish students, "OK, class, do I have to remind you what happens if I don't get those essays on Gwendolyn Brooks by Friday?" The valor and devotion of American teachers is beyond doubt. In one school shooting after another, teachers and staff have risked and even given their lives to protect their students, including geography teacher Scott Beigel, football coach Aaron Feis and athletic director Chris Hixon, just last week at Marjory Stoneman Douglas High School. But would strapping guns on teachers make them educators, or armed guards? What happens if and when a teacher's gun is left unlocked or is stolen or gets wrestled away from a teacher by a disturbed student? Would giving guns to teachers make students feel safer — or even more on guard, when they should be open to learning? Isn't it already hard enough for teachers to teach?